This is why it’s a winner. 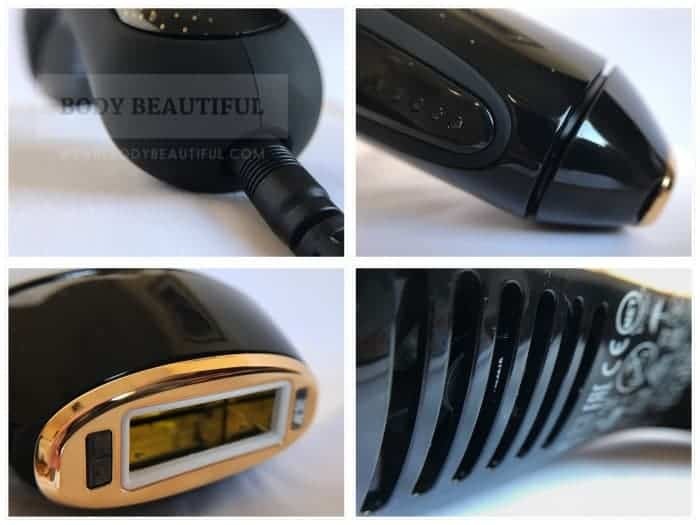 Superb value, uniquely with unlimited flashes so you’ll never run out, plus high IPL power for faster and longer lasting results. Sleek, sophisticated and simplicity itself. The fool proof tone sensor detects and sets the optimum intensity for your skin before every flash. Perfectly balanced power & safety that’s almost effortless. Fast 2-second flashes at the highest intensity so you can cover a full leg from 8:30 minutes. One of the best. Professional, knowledgeable, dedicated support from Smoothskin with the best web resources and support program available. Love the 90-day money back guarantee. Relatively few reviews for this new model but initial feedback is positive. Pay a premium price for a premium model. It’s worth it. The Smoothskin Muse is safe for use at home on the body and face. It uses Intense Pulsed Light (IPL) which slows and reduces hair regrowth after each treatment. Eventually hair stops growing and periodic sessions keep your skin silky smooth. 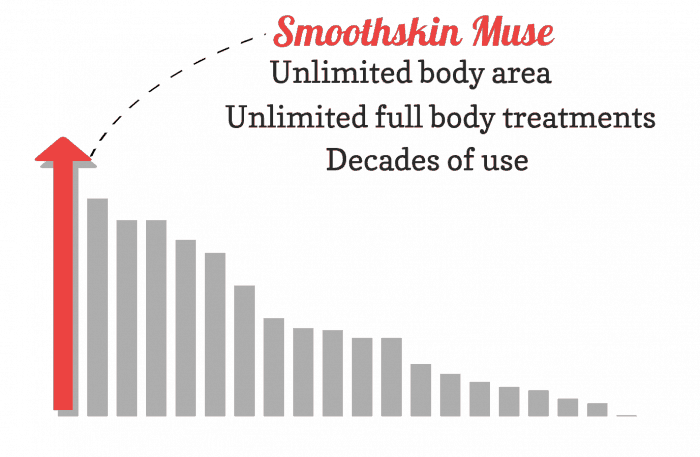 The Smoothskin Muse is the latest model from Smoothskin packed with some market leading advancements. 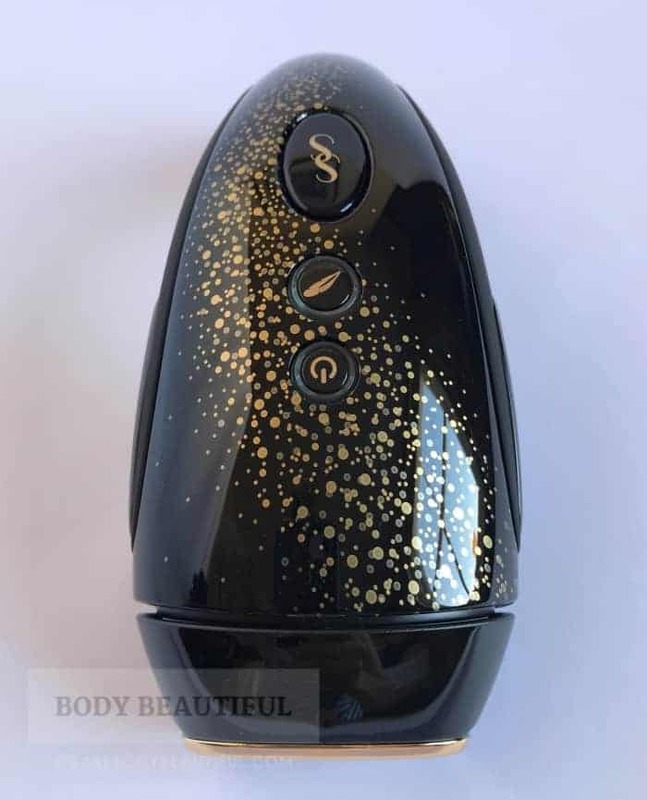 It’s manufactured in Swansea, UK by Cyden Ltd. Cyden launched the first home-use IPL device in the UK with the Boots Smoothskin IPL system. They mean business. It’s currently available in Japan and the UK and has CE certification to meet EU standards of efficacy and safety. 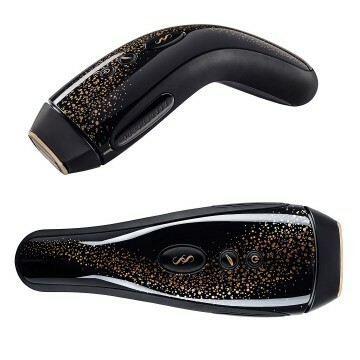 I loved the updated sleek, black and speckled-gold design. It’s comfortable to hold and the long tapered handle keeps the power cord out of the way . It provides important leverage and reach too. Learn more about the throughtful ergonomics in the full tried-and-tested review. You’ll need 12 weekly treatments taking 11 weeks to complete. Then top up treatments spaced between 4 to 8 weeks will keep you continuously hair-free. Users report even less frequent top-ups the longer you’ve used it. Smoothskin do not disappoint. This is another excellent home IPL device that delivers superb results. They’ve updated the SS Gold model and this is the result. 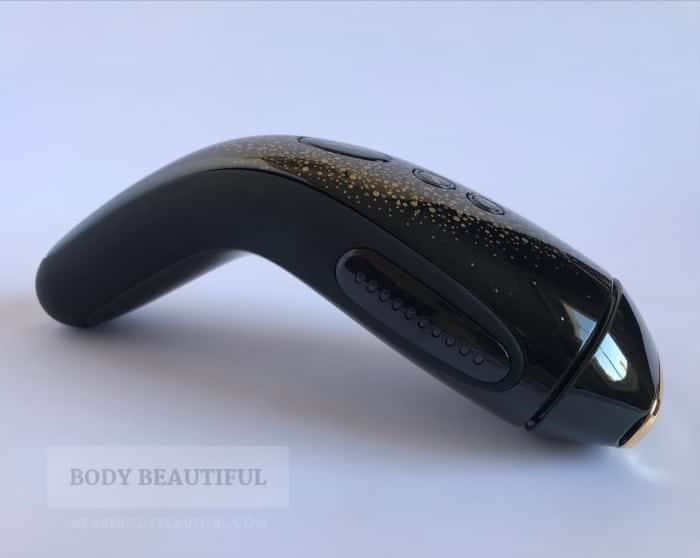 It has the same great ergonomic design and advanced skin tone sensor that checks your skin and selects the best intensity for you. And it’s just as powerful for fast and long-lasting results. The key difference is the updated technology that now means there’s no limit on the IPL lamp. The flashes will NEVER run out. Smoothskin are the first to bring unlimited flashes to us in their devices. This superb performance and value raises the benchmark. 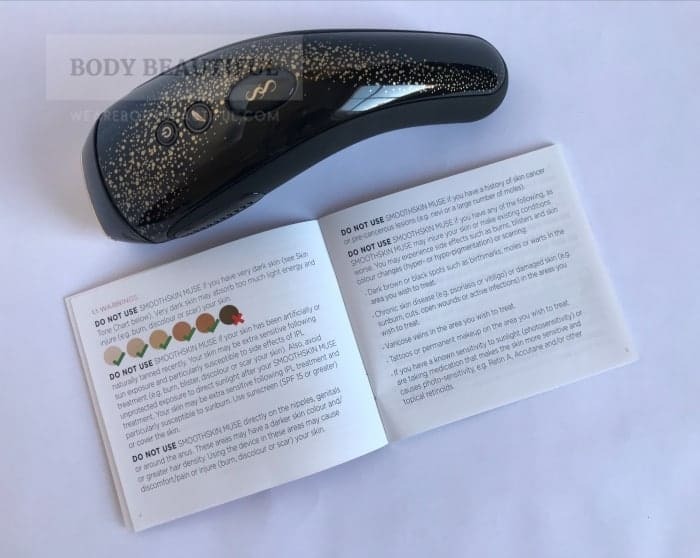 Read this full tried-and-tested, in-depth Smoothskin Muse IPL review to learn how easy it is to use, all the pros and cons and what alternatives you could consider. Should I buy the Smoothskin Muse? In recent years Smoothskin, Philips and Silk’n have released models with 100s of thousands of flashes. Because IPL results get better and better over time, that’s likely more than you’ll ever need. But just to be sure, Smoothskin have gone either further. They’ve always been a pack leader when it comes to lamp lifetime. And now they give us the SS Muse. It’s the first high power home IPL device to give unlimited flashes from the lamp. It’s the best available. The Smoothskin Muse provides the best of all device for value for money. You get unlimited flashes from the lamp. So that’s unlimited full body treatments. It’ll keep flashing as long as the Muse keeps working. It’s built to last so that may be decades of use. You’ll get unlimited full body treatments or small area treatments. It’s unbeaten. The flashes will keep coming as long as the device doesn’t break. So, you don’t need to worry about running out. N.B. General usage and wear and tear can also affect how long the machine keeps working. It arrives in a neat and compact black and orange box. I love the packaging. It’s stylish and colourful without being garish. 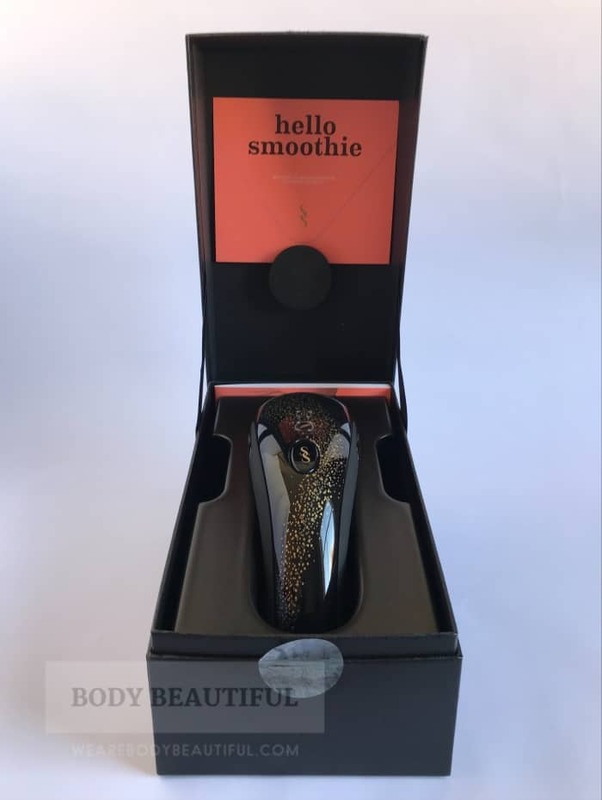 Smoothskin have put a lot of work into the design of the packaging. Just like the Smoothskin Bare it’s complete, clear, concise and very well laid out. I love the friendly tone, sense of personality and fun. It’s a brilliant first impression. The sleeve shows all the important information about the Muse. 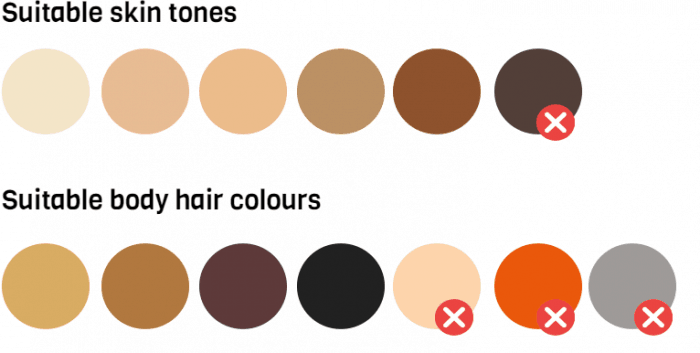 There’s a clear safe skin tone chart and it notes it won’t work on light hair. 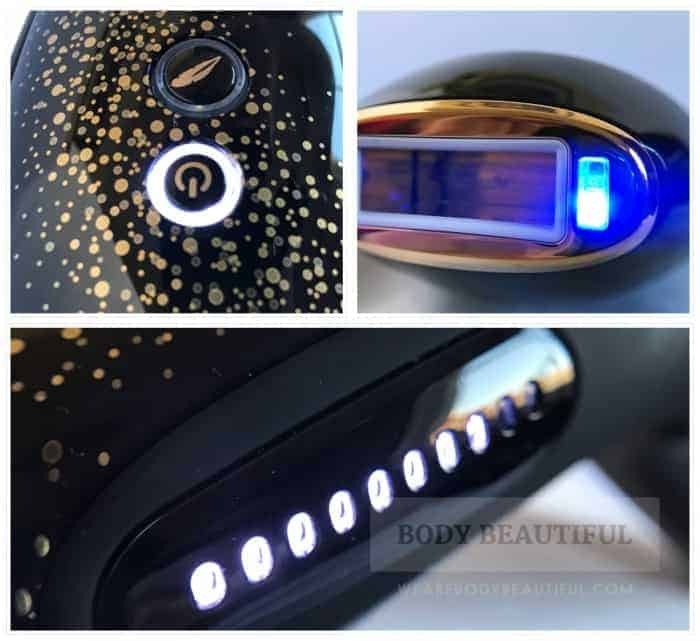 It concisely explains it’s a powerful IPL device which can vary the intensity for a bespoke treatment, controlled by the advanced skin tone sensor and gentle mode. It also notes you get unlimited flashes. “As long as you keep up with top-ups, the chore of daily shaving will soon be a thing of the past”. Overall, it’s friendly, clear and kinda playful. Now I just want to see what’s inside. Remove the tabs carefully so as not to damage the box. Opening it is a genuinely delightful experience. Smoothskin have nailed it. The support programme welcome invitation is creative and fun. It lends a personal touch and a bit of character (and makes me feel special. I like to feel special). Carefully removing the device in the black cradle reveals the user guide booklet tucked down the back, the power cable and mains plug in small cardboard boxes and a black satin storage pouch to protect the Muse from dust and scratches. 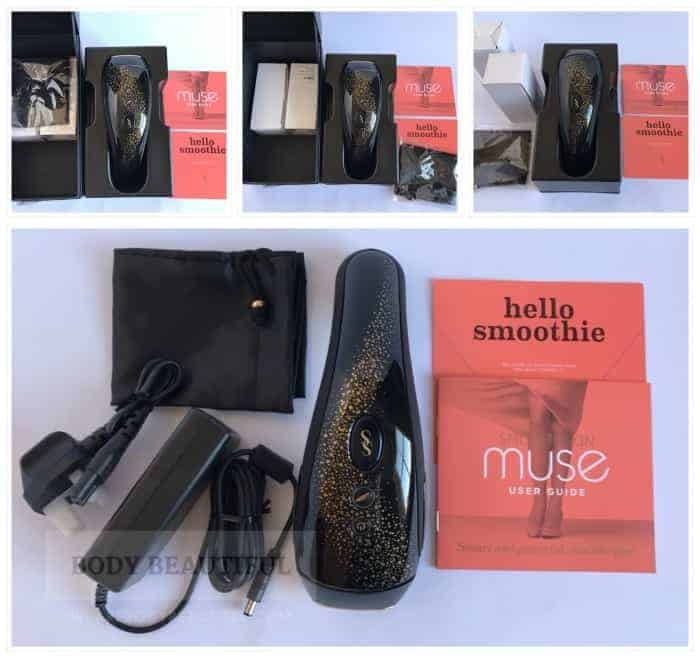 The full contents of the Smoothskin Muse box: Muse IPL device, user guide booklet, support programme invitation, power cable / pack and mains plug (UK shown here), black satin storage pouch. Next, does the Muse make a good first impression? Firstly I love the gold dust speckling swooooosh across the glossy back top. It’s smooth and cool to the touch. The black and gold colourway is unlike all the others. It’s sleek and sophisticated. There are only 3 buttons on the top. It doesn’t look complicated. But it looks like it means business. I need more speckled gold dust in my life. Along each side is a matt-black silicone grip that your fingers naturally rest on. It’s a bit bigger than I expected but not too heavy. There’s a natural grip and it’s balanced in my hand. It feels quality, well-made. This looks the business. Sleek and powerful lines, a touch futuristic. And it feels every bit as good as the beautiful aesthetic design. It’s pretty stunning. The power cable detaches and fits snug in the end of the long handle. The business end is tapered with a gold tip so it’s easy to see from most angles. The rectangular flash window has 2 small skin tone sensors at either side. There are cooling fan vents on the underside of the device along with all the relevant safety and standards marks. Onto the user guide booklet. It’s the best place to start. And this one is actually a pleasure to read. Some of the print is very small. But overall (if you can see it) the user guide is very easy to follow, clear and concise. I love the conversational tone and logical order. The warnings, precautions and eye safety information is the least exciting but very important. Please read it carefully! The opening paragraph sorta took me by surprise. None of that serious flat language you get in other guides. Granted the next 6 pages of warnings, precautions and eye safety are quite dull, but entirely necessary. Please read them to check there’s nothing preventing you from using the Muse. The guide is well laid-out, logical and beautifully designed with clear headings and diagrams. But most of all the tone of voice is friendly and conversational. It’s clear, concise and easy to absorb. Top job. After tanning, your skin is extra sensitive with increased risk of IPL side effects such as burns, blisters, discolouration and scarring. It’s more sensitive after treatments too so there’s a higher risk of sunburn if you go out in the sun. Learn more here. Smoothskin say don’t use the Muse on recently tanned skin, including artificial tans. After your treatments also cover up and use a sunscreen of SPF 15+ to avoid unprotected sun exposure. The website FAQs advise avoid the sun for at least 7 days before and after your treatments. The user guide explains how to do a test patch. It’s very simple because of the advanced skin tone sensor. More on that later. 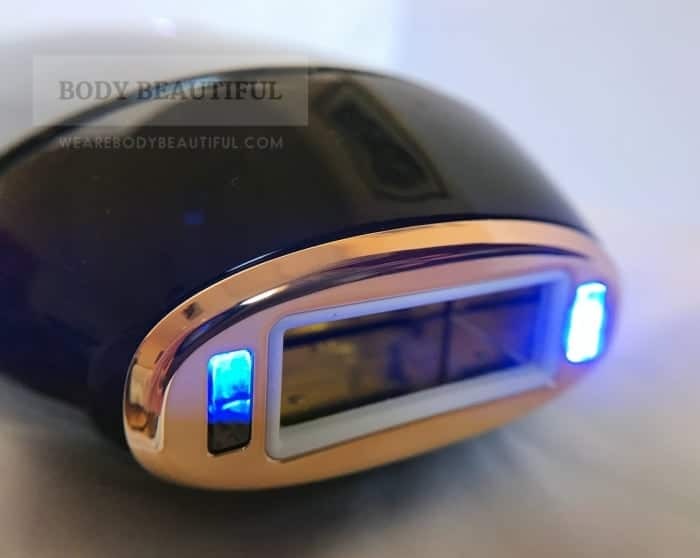 Shave your test area (for each body area you’ll treat), power it on and do two side by side flashes. Wait 24 hours and if your skin has no reactions, you’re good to do the full treatment. Wait 24 hours after your skin test and if there’s no reaction you can start. It’s the most simple to use. Shave, cleanse and dry your treatment areas. Plug it in and press the power button so the light changes from blue to white. The skin tone sensors illuminate blue. If not in use for 3 minutes the device will revert to standby mode and the power button shows blue. The flashes are bright, and the user manual tells you to look away for each flash. Make sure you use it in a well-lit room and you can try wearing shades if it’s too much. Your skin must cover both skin tone sensors before it’ll flash, so this avoids any accidental flashes. I like that it’s mains-powered so there’s no down-time while charging. It’s ready when you are. You get 2 metres of good quality flexible cable for plenty of room to manoeuvre. The cable is 2 metres long to the power pack. 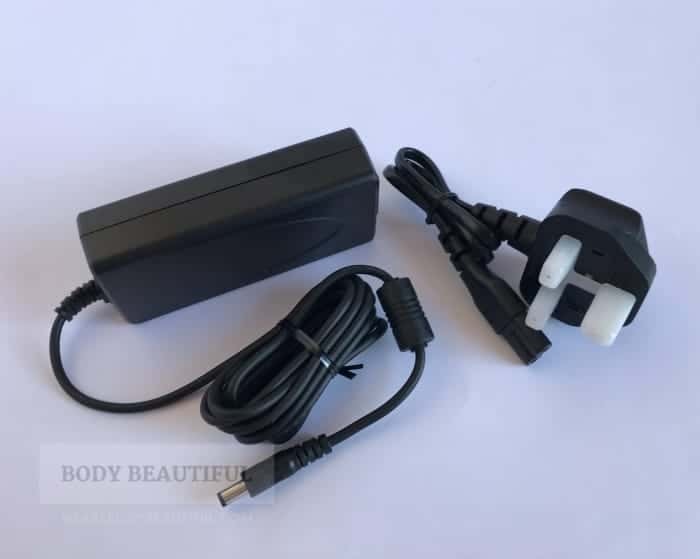 The mains cable plugs into this and is an additional 40 cm long. So, the power pack sits just below the socket and you get the full 2 metres of cable to play with without being weighed down. The cord is flexible and not too thin. It doesn’t wind around itself and end up in knots. If you want to sit on your bed or near to a full-length mirror you can use an extension cable to give you even more length. The Muse is comfortable to hold and easy to manoeuvre around your body. It weighs about 367g so it’s light-weight for such a powerful device. I like the long handle and the perfect position of the flash button. The handle fits snug in the palm of my hand as my index finger naturally rests on the flash button. This is the most comfortable grip for covering large areas (like legs) with speed. It affords a bit more reach for backs of legs and knees. And it felt most natural on the feet, toes, bikini line and underarms. Alternatively, try resting your thumb on the flash button, grip the side of the handle with your fingers wrapped underneath. This works well for the insides of your thighs, bum cheeks, backs / top of legs and tummy. 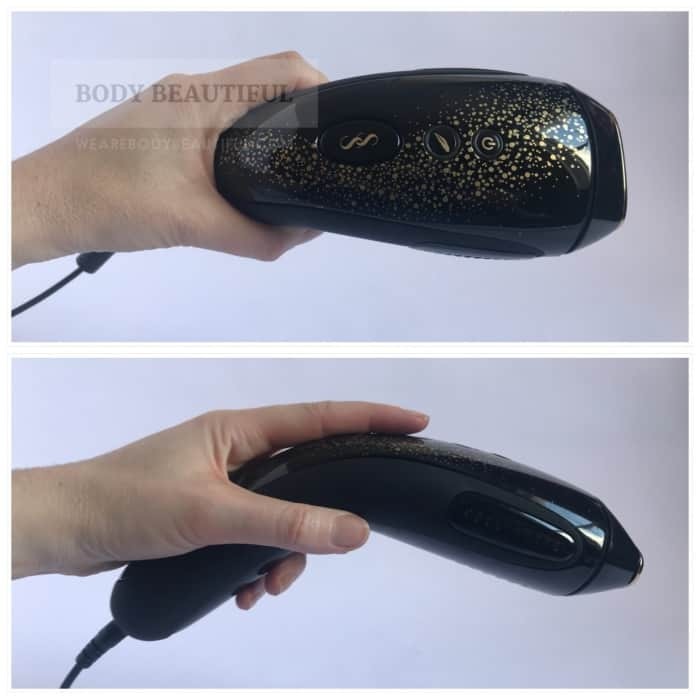 The Muse’s curved handle and placement of the buttons are perfectly precise so they provide different intuitive grips and excellent comfort in use. The length helps reach awkward areas like the back of your knees and it’s easy to see where you’re positioning it for excellent coverage. This is my 2nd favourite of the home IPL choices. Another grip I find helpful for my face (chin, under chin and upper lip) is resting the underside on my thumb and pressing the flash button with my index and fore finger. The other buttons are further along the top so they’re safely out of the way. Therefore, with both these grips you can continue without interruption. I find it easy to get accurate coverage using any grip (moving it along 1 cm at a time) because the angle ensures perfect visibility of the treatment end. It’s easy to explore the different grips and quick to get comfortable and efficient with it. This is an excellent design that helps you get accurate coverage and is very comfortable to use. So, is this thing safe? The Muse has one single flash window. It’s safe for both body and face. At 1 cm high by 3 cm long it’s the best size and shape for a multi-use flash window. The flash window is 1 cm by 3 cm. It’s big enough to cover larger areas fast and narrow enough to fit your upper lip. The skin tone sensors (illuminated blue here) must have full skin contact or it won’t flash. So, it can take a bit of practise to position but it doesn’t take long to get the hang of. It’s big enough to cover your skin fast on large areas like legs. And it’s narrow enough to position on small areas like your upper lip. This can take a bit of practise but you soon work out how to do it. For your upper lip try blowing out your cheeks or turning your lips in around your teeth. This makes a flatter surface. For shins and other bony or uneven areas, you can try turning the device 90 degrees so the length of the flash window runs down the bone. Would other specialist windows improve it? I do like the no-faff design off the Muse. And I think additional attachments would detract from the brilliant plug-and-go simplicity. It may take a bit more manoeuvring on some areas but it does the job better then most. They do help but aren’t necessary. There are 2 smaller sensor windows at either end of the flash window. Both must have full skin contact before the Muse will flash. This safety feature protects your eyes so you can’t accidentally flash it into open air. They’re also the advanced skin tone sensors. Like other skin tone sensors, the Muse keeps you safe by checking for a suitable skin tone (Fitzpatrick tones I to V). If your skin is too dark it won’t flash and the side LED indicators light up red. But the skin tone sensors are more advanced. They continuously check your skin and set the optimum intensity level for the tone. They do this before every flash. Each flash therefore adjusts to the perfect balance of safety and power. (Left) The LED intensity indicators show red if your skin tone is too dark for safe IPL treatment. (Right) The skin tone sensors adjust the intensity to the exact safe skin tone and the LEDs show white up to the level set (1 to 10). The Muse has 10 intensities – 1 is low and 10 is high. The IPL energy output ranges from 3 J/cm2 to 6 J/cm2. It’s one of the most powerful home IPL hair reduction systems available. You get faster and longer lasting results using the highest intensity that safe for your skin. The 10 LED lights along each side show you which level is set. This feature is referred to as Variable Pulsed Light (VPL). So, there’s no need to stop and check your skin tone across different body areas. It’s great for you if you have varied tones across your body. You can just keep going until you’re done. Here the power button illuminates white and the skin tone sensors bright blue. The Muse is in ‘normal’ mode and ready to detect your skin tone. Place the flash window on your skin and the LED intensity indicators show white up to the level that’s set. It checks and sets the intensity before every flash so you can just keep going with your treatment. That’s less faff and uncertainty so you get it done fast and at the most powerful intensity that’s safe for your skin. But you do have an option if you find the flashes smart in more sensitive areas. You can activate ‘gentle’ mode. Some areas are more uncomfortable than others, like the underarms and bikini line. That’s because they have thicker and denser hair growth. So, you may want to reduce the intensity a bit, especially for the first few sessions when more hairs are actively growing. Pressing the ‘feather’ gentle mode button reduces the IPL intensity output of the flashes. Activate ‘Gentle’ mode by pressing the ‘feather’ button. When activated the button illuminates white. Press the feather button again to return to normal mode. Gentle mode effectively halves the IPL intensity so you’ll see half as many LEDs showing white. Once you’ve finished with Gentle mode don’t forget to turn it off and go back to normal mode as this gives you the fastest and longest lasting results. It’s a good option to have, but many people don’t need to use it. And remember you get faster and longer lasting results using the highest intensity that’s safe for your skin. As well as Gentle mode to control the intensity, there are 2 ways you can control the speed of flashes. For Stamp mode: Press and release flash button for a single flash. Move to the next spot and repeat. This is good for small areas like upper lip or around ankles where you need precise placement. For Glide mode: Press and hold the flash button for continuous flashes. Flash, glide 1 cm to the next spot, flash and repeat. The flashes come every 1 to 2 seconds so it’s pretty close to a gliding motion. Be sure to only flash each area of skin once. Glide means there’s no repetitive button pressing (annoying on large areas) and it reduces strain on your grip. It’s also fast to cover your skin. Press and hold the flash button for glide mode. It flashes every 1 to 2 seconds. Between flashes move the Muse along 1 cm (the height of the flash window) to the next spot. This ensures good coverage with no gaps or overlap. It’s fast to cover your skin. It’s one of the fastest, beaten by only one other for legs and large areas. The big 3 cm² window and flashes that come every 1 to 2 seconds, means you can treat a pair of underarms (an area roughly 120 cm²) in 40 seconds up to 1:16 minutes. The flashes are faster on the lower intensities. It takes between 8 and 10 minutes for a full leg. It’s fast, so it’s a great choice for treating large areas or you full body in one manageable session. Or continue for a quick round-up of the pros and cons to help you decide. 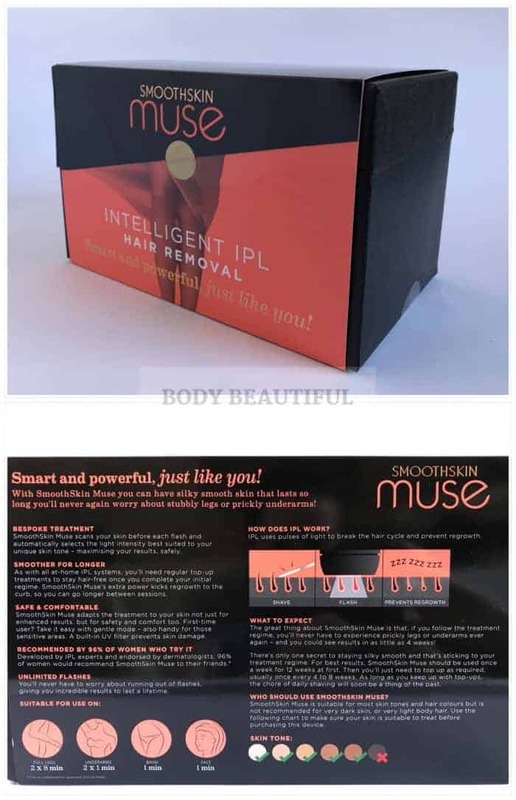 The Muse is a good-looking high-performance home IPL machine. It’s very comfortable to use and practically effortless thanks to the advanced skin tone sensor. And you’ll never run out of flashes – it’s built to last too. It’s a great choice for full body treatments because the application speed is fast (full leg in around 10 minutes). But it’s just as good for small areas too. If you have light skin take advantage of the high IPL power to get your fastest and longest-lasting results. And if your skin is darker, rest assured it guarantees safe treatments because of the advanved skin tone sensor. And if you’re still undecided remember Smoothskin give a 90-day money back guarantee period (available through the retailers below). That, and the 2-year warranty, are great peace of mind. It’s my Best home IPL for no-faff power, fast & endless flashes. You can check prices or buy the Smoothskin Muse using the links below. 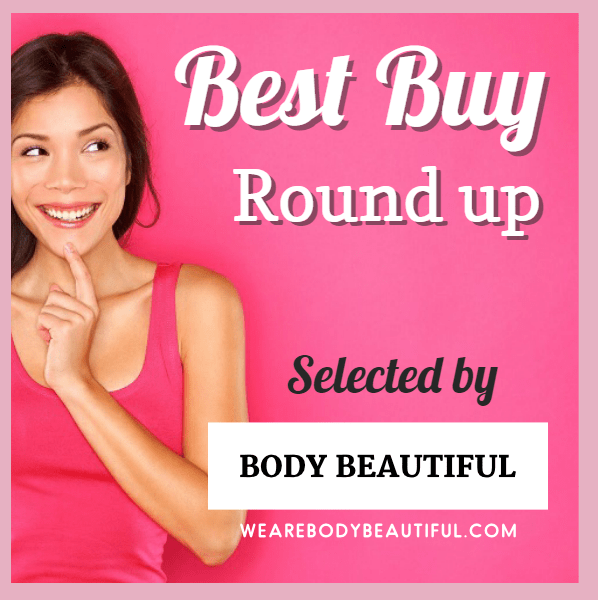 Buy from Currentbody: UK & Global shipping, 90 day money back guarantee. Buy from Amazon: UK shipping, 90 day money back guarantee.